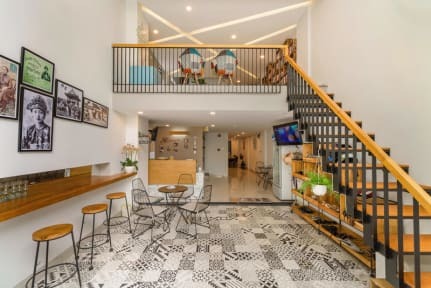 Pedersen hostel is located only 5 minute from the city center, 5 minute walk to the My Khe Danang beach and there are many amazing restaurants, Korean community all over the neighborhood. It is newly built 7 floors with 10 private double-bedrooms and 1 dorm room (8beds) to accommodate your every need. At Pedersen hostel, you can enjoy the new modern, comfortful, clean space as well as friendly quiet neighborhood. The entire hostel was professionally designed from lobby to rooftop by an architect. All the rooms have a very brand new luxurious feeling as I designed them myself. 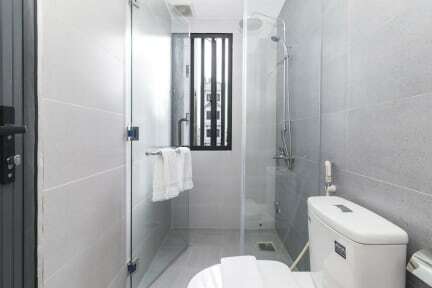 Each room has its own sparkling clean washroom, closet, air conditioner, working table, wifi. Besides, you are supplied with towels, shampoo & shower gel, free light breakfast with coffee every morning. We have a kitchen which is available for all to use and we also have a washer for your clothes, rooftop, library. Especially, we install elevator and in each floor we have cameras, two emergency exits, fire extinguishers and fire alarms in order to take care of your safety.